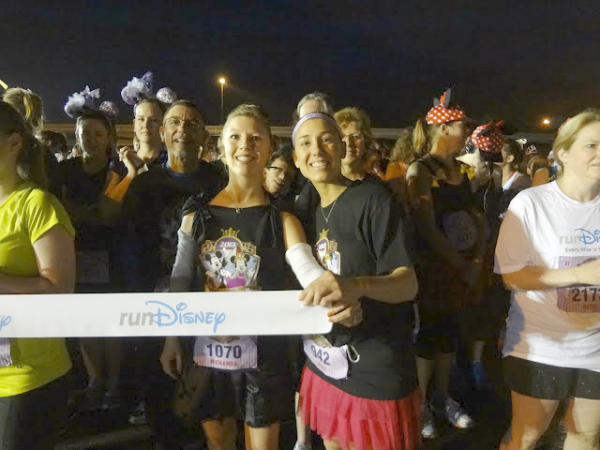 I love the Disney Royal Family 5K's. I love how excited everyone is for so early in the morning and I love the costumes that people wear. 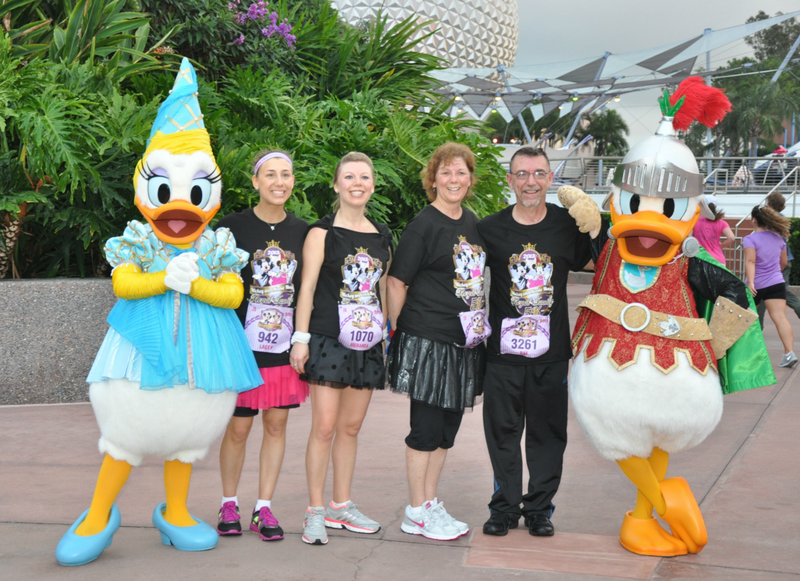 There are princesses, pirates, Minnie Mouses, and even a few non Disney super heroes! 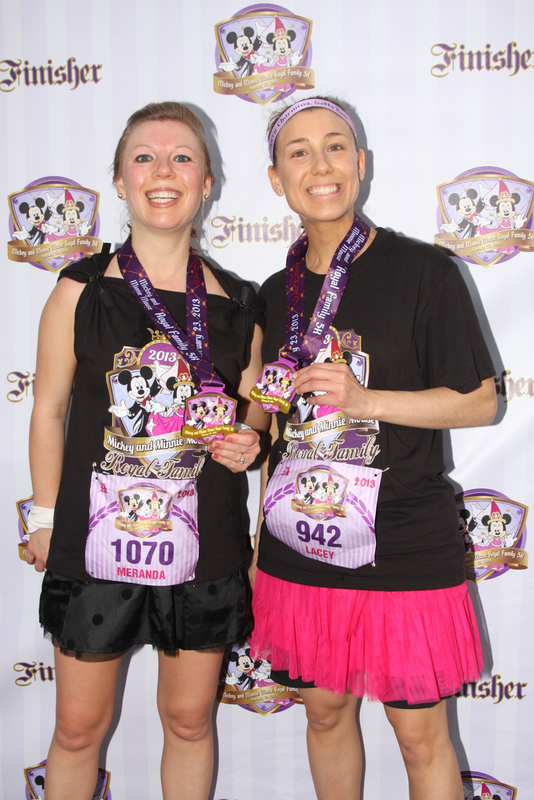 We opted to wear the 5K t-shirt and us girls wore little skirts. I normally would want to wear leggings because I would be cold, but this morning is quite warm and only slated to get warmer as the day went on. 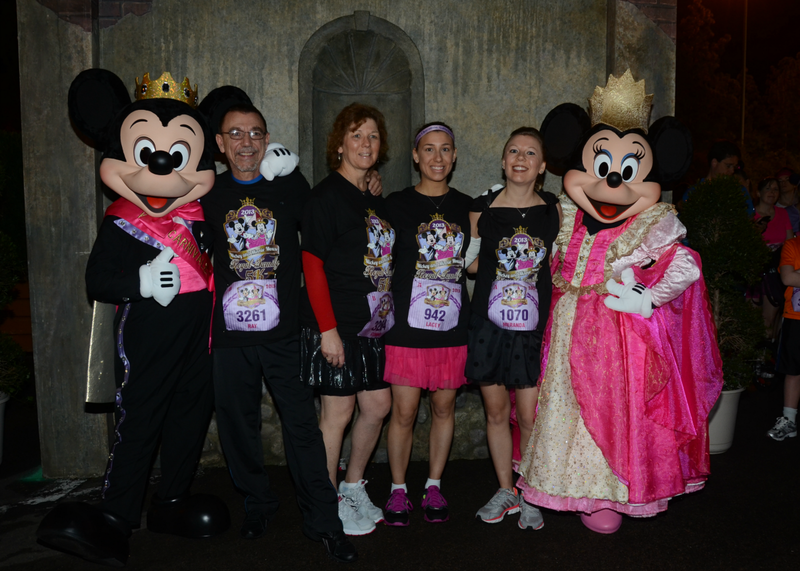 As we got to the staging area, we waited in line for a picture with Royal Mickey and Royal Minnie. 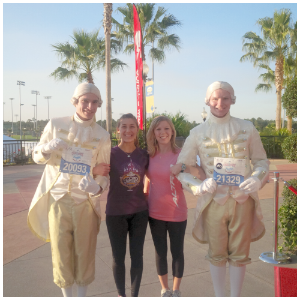 Afterall, that was the theme of this years Royal Family 5K. After that it was time to get in to our corral. This year runners got corral letters posted on their bibs, in previous years this did not happen. My sister and I were both in corral A and our parents were in Corral B. There was a lady checking your bib letter as you entered the corral to make sure that you were in the right one. We showed the lady that we had corral A on our bibs but kindly asked if we could run in corral B because we wanted to run with our parents. She smiled and left us through to coral B. As in any race, you are always welcomed to move back a corral, but not forward. Meranda and Lacey in the corral. Six minutes after the first coral started, another set of fireworks went off signaling the start of coral B. We were off. Because we were all running at our own pace, we lost each other during the first mile. 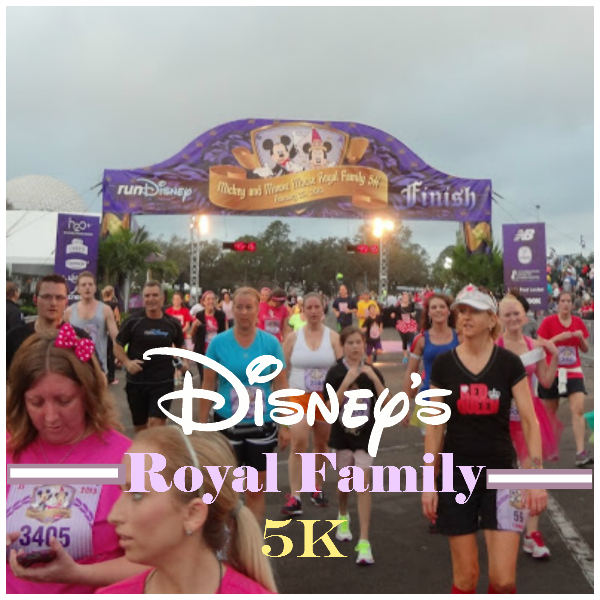 If you've read any of my previous posts on the Royal Family 5K, you know that the first mile is basically parking lot and a back road. It's a very boring run. Things don't get interesting until you enter Epcot. We enter through the back of Mexico, run around World Showcase, and over the bridge leading to the United Kingdom. This is where I finally caught up with my sister. Instead of going directly to the United Kingdom, the course turns and we run through the International Gateway ( this would be where you enter or exit Epcot to go to the Boardwalk, Beach Club, etc). The course comes out somewhere a bit before Canada. As we were running by, I showed my mom the building where we had the pasta in the parks party last month for the marathon weekend. Our family was all together again buy the time we entered Future World, so we stopped to get a quick pic with Donald and Daisy. We are now more than half way done with this race. As we are running towards spaceship earth, I ask my mom if she is ready to do 10 more miles after this because that is approximately how many more we would have to go to reach our goal of doing the Princess half! We round spaceship earth and now doing the last .1 of the race. My sister is in the lead, and my parents and I are pretty much keeping pace with each other. My sister crosses the finish line first and I thought that my parents and I would cross together, but at the last second my dad speeds ahead of us. So we finish in the same order we did last year, my sister, my dad, and then me and my mom. 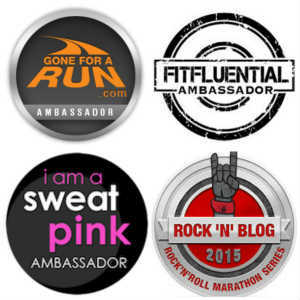 We make it through the chute and get our finishers medallions. I'm liking the purple lanyard on this one. Now I consider myself to have a collection, so I should find away to start displaying them when I get home. After we receive our medallions we pick up some water and then head to the snack tent for our bananas and snack boxes. This will come in handy later this afternoon at the ballgame.